You are cordially invited to the first annual fundraising auction for Hayden's Ferry Review, Arizona State University's internationally-distrubuted and -renowned literary journal! This is the literary event to end all literary events. Come rub shoulders with fiction writers and poets, eat and be merry! Join the Facebook event here. Private screening of Don't Tell Mom the Babysitter's Dead with Tara Ison (co-writer of the movie!) with behind-the-scenes commentary/gossip! A gritty realism story starring you, to be written by 2011 Swarthout Winner Courtney Fowler! A table tennis lesson from Peter "The Paddle" Turchi! Fake Letters from Famous People for a whole month, written by the real Jeff Albers (frequent McSweeney's Internet Tendency contributor)! One hour Reiki healing treatment session with Melissa Pritchard! A visit to the Marshall Butterfly Pavilion with Cynthia Hogue! Mixed doubles with Sally Ball and Ted McNally! Behind-the-scenes look at Books & Company with Alberto Álvaro Ríos! Signed books and broadsides from esteemed faculty and visiting writers! Fingerless gloves and a lapghan knitted by the legendary Aunt Stella! Gift cards from local businesses! Items up for bidding have been donated by creative writing students, faculty members, local businesses and other friends of the MFA program in creative writing. 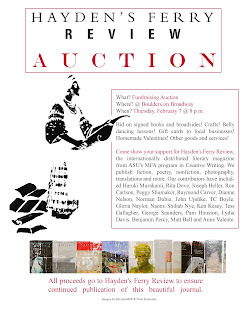 This event will feature both live and silent auctions, as well as the opportunity to purchase or subscribe to Hayden's Ferry Review. Free admission. Open to the public. Bring your friends and family, neighbors and nemeses. Housed in the MFA program in Creative Writing, Hayden's Ferry Review has published fiction, poetry, nonfiction, translations and art from both established and emerging writers and artists since 1986. Our contributors have included Haruki Murakami, Rita Dove, Joseph Heller, Ron Carlson, Peggy Shumaker, Raymond Carver, Dianne Nelson, Norman Dubie, John Updike, TC Boyle, Gloria Naylor, Naomi Shihab Nye, Ken Kesey, Tess Gallagher, George Saunders, Pam Houston, Lydia Davis, Benjamin Percy, Matt Bell and Anne Valente.